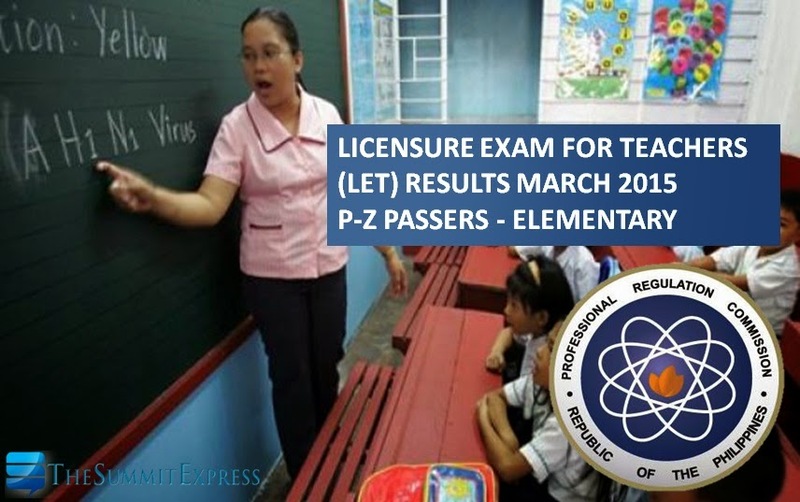 Those awaiting results of March 2015 Licensure Examination for Teachers (LET) may now check on this webpage the complete list of passers as the Professional Regulation Commission (PRC) released full results today, May 23, 2015. Teachers board exam was administered by the Board for Professional Teachers (BPT) on March 29, 2015 in several testing centers nationwide. PRC announces that 12,103 elementary teachers out of 44,144 examinees (27.42%) successfully passed the Licensure Examination for Teachers (L.E.T.) It is further announced that of the 12,103 elementary teacher passers, 5,607 are first timers and 6,496 are repeaters. Takers may now view on this page the alphabetical roll of passers for P to Z Surnames.